an atlas and text-book, with special reference to modern diagnosis and the most approved methods of treatment. New York : E. B. Treat, 1897. Description : [2 fl], 424 pp (i. e. 324), [2fl] ; ill., 50 pl., 28.5cm. Photograph: 50 photo-engravings, most in color. Subject: cutaneous diseases, materia medica. Printer's error in pagination of the first edition. Originally issued in fascicles which were bound and dated each year until the second edition. Second revised and enlarged edition with 51 plates appeared in 1902. A third edition was issued in 1906 with 60 plates. Pictorial representation, a recognized aid to the practitioner in every department of medicine, is of preëminent importance in Dermatology. Most of the symptoms are objective and visual, and the diagnosis must generally be made by the eyesight alone. It is difficult to represent in words the manifold impressions and the delicate variations of color and shape that are so readily appreciated through the optic nerve. Many attempts have been made to depict on paper and preserve permanently the evanescent features of skin diseases. Photography and its dependent processes are satisfactory as regards form ; but color, an element of equal importance in depiction, is absent, and its subsequent addition by hand is costly and rarely satisfactory. Chromolithography also is necessarily more or less crude, since it is an attempt to imitate the thousand tints and shades of nature with a few striking colors. The color-prints in this atlas have been made by a new photomechanical process, entirely with the camera and printing-press, and combine the permanence of chromolithography with the delicacy of hand-work. In suitable cases, where color is of no importance for the recognition of the disease, illustrations in black and white have been introduced. — Gottheil. The innovative color process was considerably less expensive than the hand coloring used in the Fox atlases, but E. B. Treat reduced costs even further by limiting the number of color plates and substituting black and white illustrations for the less nuanced skin disorders. There are 141 text figures in the Gottheil and 15 of the 50 full page plates are also printed in black and white. By comparison the Fox atlas issued by Wilan and Appleton in 1897 comprised 100 illustrations on 80 plates that were "photographed from life and colored by hand." It would have been appropriate for Gottheil to acknowledge the work of Fox beyond the occasional therapeusis such as a treatment of alcoholic solution of quinine, 1 to 100, which Fox recommended "very highly" for Hyperidrosis manuum. This is on page 59. Both men practiced in New York City but Fox probably distanced himself from the heat of Gottheil's ambition, especially after reading the indirect disparagements G. wrote in his preface. 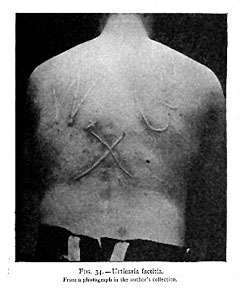 That G. may have had a penchant for the self-aggrandizing flourish can be detected in a photograph for Urticaria which shows a man's back inscribed with the initials 'W' and 'G'. The large welts bring to mind the offending initials of Allan Zarkin. The first 53 pages provide an anatomical review of the skin and an introduction to specialized instruments which are illustrated by a double page wood engraving. 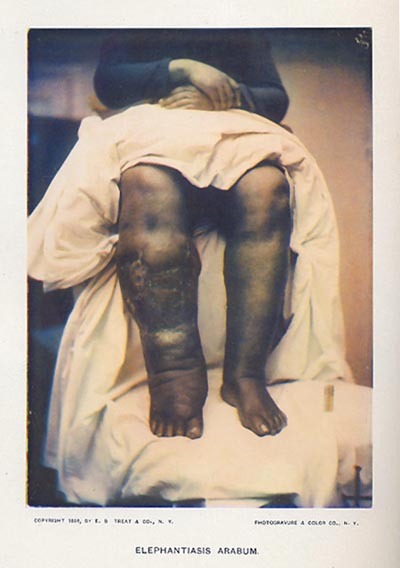 Gottheil writes that he is using the classification of Jessner, "slightly modified", which classifies cutaneous diseases under six general headings: I- Functional Disorders II- Circulatory Disorders III- Inflammations IV- Hypertrophies V- New Growths and Class VI- Atrophies. The bulk of the book, pages 86-240, takes up descriptions of inflammatory skin diseases which includes parasitic afflictions that Fox classifies separately. Gottheil descended from an accomplished European family. He was born in Berlin, first schooled in Manchester England, and graduated from Cornell in 1879. He received his medical degree from the New York College of Physicians and Surgeons and held the post of house surgeon of the Charity Hospital from 1882 to 1883. Gottheil lectured at the Polyclinic was associated with the Lebanon Hospital in the Bronx, both the Northwestern and the West Side German Dispensaries, and a consulting dermatologist to the Orphan Asylum of the Sheltering Guardian Society, and a fellow at the New York Academy. His father Gustav was rabbi of Temple Emanu-El in New York City and a progressive who figured importantly in the reform movement. He launched the Zionist Organization of America and instituted associations with Christian churches. The hymn "Rock of Ages" is sung to Gustav's lyrics, adapted from a tune written in 13th century Germany. The most remarkable attribute of this atlas, beyond the weird coloring of the experimental color printing, is that almost all of the 200 photographs are the work of the author. Gottheil photographed with such a shallow depth of field that it is reasonable to speculate whether his camera even had a stopping iris. A desquamatous patch of skin, the weeping pustules of an eczema (Plate XV) come brilliantly into focus as other facial features drop into a mist of draped color.